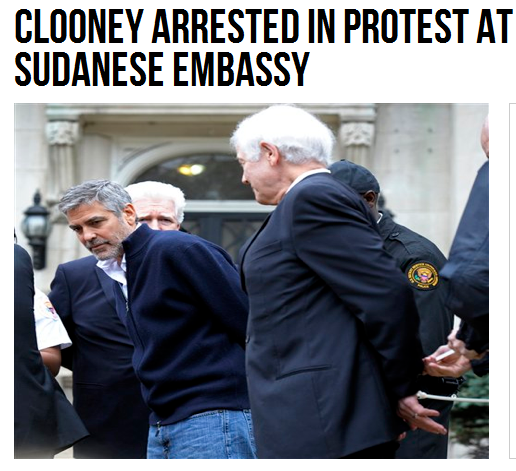 GEORGE CLOONEY ARRESTED OUTSIDE SUDAN EMBASSY IN – The Tundra Tabloids……. In spite of Clooeny not mentioning the chief cause of the Sudanese attacks of jihad against the South, Islam, he does deserve some credit here. Well done. Actor George Clooney and his father have been arrested at a protest outside the Sudanese Embassy in Washington. The protesters accuse Sudan’s president, Omar al-Bashir, of provoking a humanitarian crisis and blocking food and aid from entering the Nuba Mountains in the county’s border region with South Sudan. Previous Post Previous Post OBAMA SUPPORTER FARRAKHAN JEW-BAITING IN SLAVE TRAD RACIST RANT IN UNIVERSITY SPEECH………. Next Post Next Post TEHRAN MAYOR DECLARES CHRISTIAN AND FREEMASON SYMBOLS TO BE BANNED IN PUBLIC……..